In recent years the use of crystals in advanced scientific experiments shows the potential of crystal as a medium for time-space manipulation. In 2016 there were reports of scientists having fashioned crystals that defy the laws of physics. US scientists have fashioned crystals that seem to defy the laws of physics and break discrete time symmetry. More recently a quantum crystal has been used to observe the bending of the space-time of the cosmos or an exotic effect theorized to occur in immense gravitational fields for example near a black hole. I came to a conclusion that crystals have the capacity to be used as instruments of time-space manipulation or precisely for opening portals or accessing other dimensions. I came to this conclusion not from scientific study but from studying ancient myths and art. Even though it sounds contradictory to link advanced physics to ancient myths, there are rational reasons for doing so. This contradiction exists because of fallacies currently existing that myths are a collection of fictional stories from the past not historical records. The truth is that myths thought often expressed in colorful language and symbolism are for most part records of real historical events. The second fallacy is that the ancient past was all primitive. There is growing archaeological evidence that there were advanced high civilizations in the ancient past, with advanced technology. The evidence in often evident in ancient advanced architectural monuments. NASA recently funded a study that found that advanced ancient civilizations were susceptible to collapse, and over 30 advanced civilizations have actually collapsed before us. This does not simply imply the collapsed civilization like Ancient Egyptian, Pre-Inca, Greek, Roman, Sumerian and Olmec, but going further back beyond 10,000 years. Academia today might dismiss ideas of an advanced ancient civilization like Atlantis as mere fantasy but few years ago who could have imagined a site like Göbekli Tepe dating back 12,000 years ago would be exhumed from the ground yielding signs of advanced architecture and art. Smithsonian Magazine states, “Turkey’s stunning Gobekli Tepe upends the conventional view of the rise of civilization” (Curry, 2008). Ancient history is rife with stories of the use of crystals to achieve incredible feats. From the magical crystal stones of Atlantis used to light up entire cities or as weapons of mass destruction, to the Omphalos stones of Greece used for interdimensional communication. Fresh in many people’s minds is the biblical story of the crystal stone tablets of Moses housed in the Ark and used not only as an interdimensional communication device but as a deadly weapon. I was examining the ancient Tree of Life myth when I noticed the curious illustrations of Sumerian and Akhadian sacred trees. They are typically depicted with lattice patterns resembling crystals, giving them a mechanical appearance. As if that is not enough, these trees are shown with two strange beings who appear to operate the trees with some hand-held gadgets or devices. It is often said that from informs us about the function. As I looked deeper into the mythological descriptions of the functions of these Tree, my hunch of a link between the Tree of Life and crystals became more solidified. The theme that began to emerge with my analysis is that ancient cultures viewed the Tree of Life as a connecting mechanism between the physical world and other worlds. They commonly viewed it as a means to eternity, a channel to the afterlife, and a conduit to the Milky Way galaxy or beyond. In principle, the Tree of Life’s function was to transport humans and non-humans from the earth to other galaxies or dimensions. In today’s world, an object or artifact that has the functions ascribed to the Tree of Life is simply considered to be a technologically advanced machine for stellar and interdimensional travel. As often portrayed in our movies, our current technologies and scientific conceptions enable us to view this machinery in various manifestations. 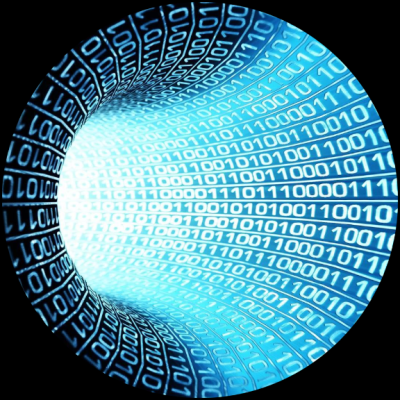 These include teleportation devices, as well as stargate and wormhole travel technologies. Hence, what we are looking at in the tree symbol is not simply vegetation, but advanced technology for traveling beyond earth and the physical realm. This concept is clearly revealed in the story of King Pacal in Mayan tradition, who uses the Sacred Tree as a vehicle for galactic travel to the stars and the underworld. Many ancient cultures clearly stated that their gods and kings used portals to travel to celestial locations. However, when we read these accounts today, we often doubt if they really meant what they said and casually relegate their words to mere religious symbolism or fictitious cultural myths. When looking at the various symbols around the world dealing with the subject of links between the physical world and other worlds, the patterns we see give us a sense of an ancient worldview rather than isolated beliefs confined to one location. The mythological imagery, symbolism, and meaning connect beyond geographical locations and maintain a consistent theme. One strange ancient object from Greece called the Omphalos stone resembles the Assyrian Tree of Life in geometry with a lattice pattern arrangement like a crystal. The Omphalos stone is considered the “earth’s navel” stone. Navel locations are considered connections to the earth and the invisible realms and are usually connected with places like Delphi, Jerusalem, Egypt, and Cuzco, to mention a few. 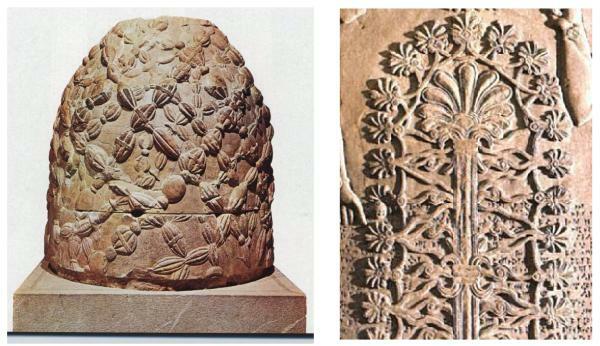 (Left) Delphi Omphalos, source: uark.edu (Right) Assyrian Tree of Life, source: assyriatimes.com. The Omphalos was believed to be an axis mundi, like the Tree of Life, which had the ability to allow direct communication with the gods. As the story goes, the Omphalos in Jerusalem is represented by the Foundation stone in the Dome of the Rock where the Ark of the Covenant was originally placed. Portable boxes similar in shape to the biblical Ark of the Covenant were used in ancient Egypt. It is then possible that the Ark of the Covenant was originally an Egyptian artifact Moses stole before escaping Egypt. An Egyptian artifact called the Benben stone. The Benben stone is pyramid-shaped and connected to the primeval mound and the Bennu bird in Egyptian myths, and is also the prototype for capstones placed on pyramid tops. Illustrations of the Egyptian primeval mound resemble the Greek Omphalos stone. The configuration of a Djed pillar and a box on a mound is reflected in the Buddhist stupas, as shown below. The stupas at Borobudur in Indonesia are unique in their shapes and arrangements. 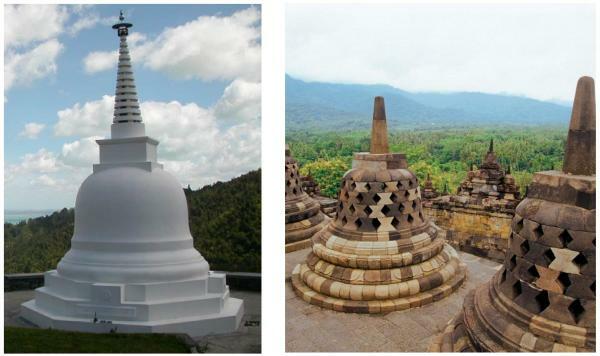 The Borobudur site is comprised of seventy-two stupas shaped like bells. Described by some as wombs of transformation, their geometry gives the impression of a mechanical device turned into stone. This stupa form, which now symbolizes Buddhist spiritual concepts, may have previously represented an ancient form of technology associated with space or interdimensional travel. This bell shape has interesting properties, as we will see toward the end of this chapter. The Borobudur stupas look like machines, and some of them actually have human statues inside them positioned as if they were piloting spaceships. It is possible that they were built from residual memories of ancient technologies, but converted into symbols of Buddhist principles. Investigations by architect Shereen Amendra on the Ruwanwelisaya stupa of Anuradhapura in Sri Lanka concluded that the design revealed the intent to create a giant capacitor capable of exchanging electric charges with the heavens. She further questioned if it was used for transforming thoughts into some electrical power form before transmitting them to celestial realms (Amendra, 2006). In the book The Symbolism of the Stupa, Professor Adrian Snodgrass from the University of West Sydney in Australia, a leading authority on Buddhist architecture and symbolism, says that the most sacred Buddhist symbols are said to have been provided by non-human sources (Snodgrass, 1985, p.3). Simply put, the stupa design has extraterrestrial origins. Cosmologist Laird Scranton puts the nail in the coffin when he says, “. . . the similarities between the Dogon granary and Buddhist stupa as aligned ritual run deep. Both are interpreted on one mythical level as representing the actual vehicle on or within which a revered mythical ancestor/teacher descended from the heavens to impart civilizing knowledge” (Scranton, 2010, p.72). He is basically saying that Buddhists support the position that the stupa represents a technological machine for galactic travel. The lotus flower is a spiritual symbol for many cultures around the world, past and present. Being a symbol of divine birth, regeneration, and spiritual development, it is considered a sacred flower in Buddhist, Hindu, and Egyptian religions (Fishman, 2014). Ancient Egyptians used the lotus flower to symbolize the sun and rebirth. Some depictions show a person emerging from the lotus, symbolizing transformation and rebirth into a different world or dimension. This implies that the lotus also symbolizes a real wormhole through which one could be transported to another dimension or galactic location. In terms of geometry and energy patterns, it also has a lattice pattern resembling a crystal. The lotus has the capacity to embody toroidal energy and torsion fields, making it a hyper dimensional vortex. Just as onion layers can be compared to a dimension, the lotus and the pinecone also embody a form that evokes multiple dimensions constantly unfolding. Another pertinent artifact is an ancient Indus tablet depicting a deity called Ahmuvan in a gate or an arch. In Indian tradition, Ahmuvan is a lord of space and time. 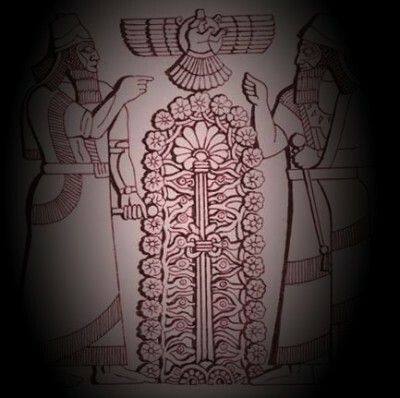 The gate has a leaf-shaped design and resembles the Sumerian Tree of Life, as well as both Sumerian and Egyptian cosmic gates with lattice patterns. Further, he has a trident or antennas on his head resembling Native American off-world beings in their rock art. His hands are clearly not human but alien. The stars depicted at the bottom of the tablets solidify the notion that Ahmuvan is a galactic being using a stargate for interstellar travel. Researcher Wim Borsboom described this gate as an arched tree open from below (Borsboom, 2011). Even that view still supports the stargate conclusion, because the Sacred Tree is a stargate to other worlds. The Cosmic Tree or Tree of Life is a metaphor from ancient myths generally relegated to cultural and religious beliefs. This myth is stacked in multiple layers of value beyond the moral and esoteric. It also has layers providing historical and technological information from the ancient past. I am suggesting that the Cosmic Tree is a technological artifact whose discovery today can change human history. Rediscovering the Tree of Life will not only reveal our hidden past but may give us secrets to instant interstellar travel, free energy, interdimensional travel and physical longevity. Strangely, when dealing with ancient symbolism there are letters and geometrical shapes that repeatedly appear on ancient structures and glyphs. These include amongst others the letters T, W/E, and H. There is a geometrical and phonetic link between the letter T and the Tree of Life. This T is also repeatedly used in form of the Tau or Tau Cross. The Tau T originates from Greek and Phoenician alphabets. Predating that, the T is part of the Egyptian Ankh. The Ankh is composed of an oval shape called the Ru mounted on the T cross. As discussed in the previous chapter dealing with Mount MeRu, the Ru is a door or portal to other worlds or dimensions. This means the Ankh is a Tree of Life with an open interdimensional door. If we view the Ankh as an instrument, its purpose could be hidden in the symbolism of its shape. Considering the above symbolism, we can guess that it was used as a portal opener. Many images depict the Ankh being held in one hand and the Was scepter in another. The Was appears to have been placed on the ground like some kind of grounding device but drawing energy from the ground and channeling it through the body to the Ankh in another hand. 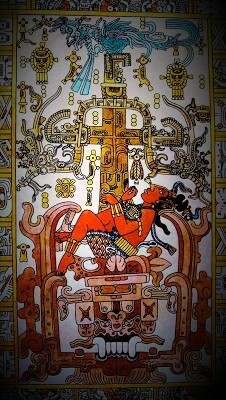 In the Aztec tradition, the Tree of Life is depicted in form of the tau cross. The Aztec Tau Tree includes a sun portal at the base and a bird on top similar to Sumerian and Egyptian depictions. The constellation name Taurus is a combination of Tau and Ru. One wonders if the configuration of stars in that location forming a T shape also has a location or sun serving as the Ru or portal to other galaxies. The Egyptians represented the Taurus constellation with the sacred bull. The sacred bull is portrayed with a solar disk between its horns also suggesting a dimensional portal opening in the Taurus horns star location. The Mayan Sacred Tree is symbolized by T letter and that T shape was incorporated in several architectural features in Mesoamerica. The T shape is not only used on Mayan temple window and doorway designs but also found in North America. T shaped windows on buildings have been associated with the Anasazi Indians whose territories of influence included not only the Chaco Canyon in north-western New Mexico but reached Colorado, Arizona and Utah. Beyond the Americas, the use of T shaped designs on ancient sites is also found at several other locations around the world. One of the most distinct features at the site of Gobekli Tepe in Turkey are the T shaped columns. There are Tau stone structures at ancient talaiotic settlements on the Menorca Balearic Islands of Spain. These sites include Torre den Galmes, Talati de dalt, Torralba d'en Salord, Trepuco and Torre Trencada, with about thirteen well preserved T-shaped structures. Huge rectangular stones placed on upright vertical ones form these T-shaped structures called Taulas dating back to about 1400 BC. Instead of just being a nice list of coincidences, the T letter and the Tau doors symbolism turns out to be important and capable of connecting the Great Pyramid, the Omphalos, the Djed pillar, and Ark of the Covenant back to the Tree of Life. Identifying the Tree of Life would have been much easier if we had its remains or remains of its components. All we have to go by today is information on its function and the symbols of its associated components. Nevertheless, if we looked around the world for the oldest object, artifact or monument, we have to wonder what object would be the closest in form or function to the Tree of Life. What ancient object has or creates toroidal energy geometry, is very advanced in design, is connected to myths of stargates, and has components also associated with interdimensional travel or communication? The closest fit to this description is the Great Pyramid of Giza. The Great Pyramid artifact is the most complex of all advanced paleo-ancient civilization monuments. It embodies intricate mathematics, geometry, astronomy, architecture, and advanced engineering. It is located at the center of earth’s land mass. This fits well with descriptions of the Tree of Life, the Axis Mundi, and Mount Meru being in the center of the garden or the center of the world. Despite what it might have been used for over the thousands of years of its existence, there is compelling evidence that it was not originally built to be some Pharaoh’s tomb. Considering its complexity and the effort required to build it, the reasons for its construction has baffled researchers for a long time. Its inner structure includes chambers, a Grand Gallery, shafts and passages. 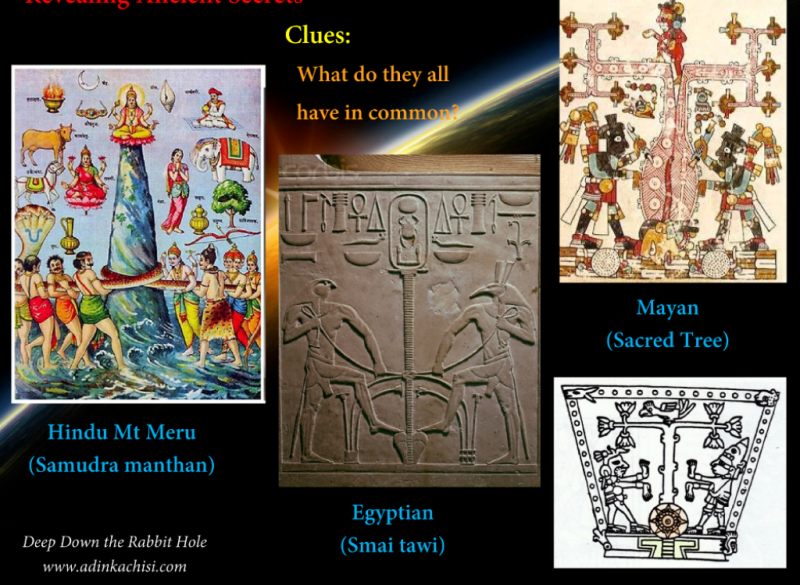 Before we proceed let us keep in mind the root words, Ta connected to the Tau Tree Cross discussed above and Mer connected to Mount Meru discussed in the previous chapter. Paying attention to the cross cultural linguistic patterns and the etymologies of names used will prove very helpful. The first clue to its connection with the Tree of Life is in the word Pyramid. It is generally said that the word Pyramid comes from a Greek term meaning “fire in the middle” combining the prefix pyr meaning fire and mid meaning middle. This concept of fire in the middle will take shape as we continue with the discussion because it alludes to the technical structure of the pyramid. The Chinese word jīn zì tǎ means pyramid, with the ta meaning tower. The root word ta also appears in the Sanskrit word Tapas or Tap meaning to heat, to shine or to burn. The Egyptian term ta is used to mean land and the symbols for the Sema-tauy representing the union of Upper and Lower Egypt consists of two beings pulling a cord tied around a T letter. The Sema/Sma symbol was sometimes used to represent the axis mundi (symboldictionary, 2016). It is the same symbols we related to the Hindu concept of ‘churning the milky ocean’ in the previous chapter, where the central pillar represented Mount Meru. Giza plateau was called Ros-tau. The hieroglyph for the letter T is a semi-circle said to symbolize bread but represent land, however it most likely symbolized a mound. This makes sense because that land was the primordial mound or omphalos on which the Sacred Tree grew. It is very likely that in pre-dynastic Egypt, the symbol of ta was used as a national symbol rather than as the equivalents of the word land. The Sema-Tawy might have been a piece of technology whose benefits or function brought Upper and Lower Egypt together rather than just a fancy diagram for national unity. A comparison has been made between the Sema-Tawy and the Kelvin water dropper (ancientstartech, 2014). British scientist William Thomson inverted the water dropper electrostatic generator in 1867. It “uses falling water to generate voltage differences by electrostatic induction occurring between interconnected, oppositely charged systems” (Wikipedia, 2016). This concept of using oppositely charged systems to generate voltage is expressed in the ‘churning the milky water’ symbolism where two enemies stand on opposite sides and cooperate. The real Sema-Tawy may have represented not just the unification of two geographical lands but the unification of the visible world and invisible world. The Giza plateau was called Rostau (Ros-tau), meaning passage mouth or entrance of an underworld realm called the Duat (Collins, 2009). In this case, the tau is used in reference to a doorway or portal to another world like the T shaped rock door in Peru discussed earlier. Osiris was called the god of Rastau. The Greeks called Jesus’ cross Stauros (S-Tau-Ros). Stauros is an inverted Rastau. The obvious connection is the Tau Cross T and the Ru O opeing. The Tau and Ru as stated earlier can be represented by an ankh. The illustration above showing the Fifth Hour of the Duat in the Amduat text found in the tomb of Thutmose III in the Valley of the Kings also gives us useful clues. 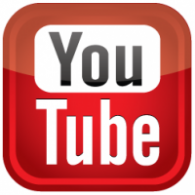 It is the story of god Ra’s travels through the underworld (Creative Commons, 2014). 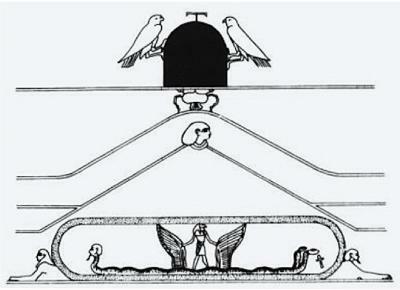 Looking at the image (Figure 94) we clearly see Sokar birds and a T-shaped object on top of an omphalos mound-shaped object serving as the Rostau gateway to the underworld. According to Egyptologist Mark Lehner the original Egyptian term for pyramid was called MR. Ancient Egypt was called Ta-Meru (John Kitto, 2015) or To-Mera (Tompkins, 1971) meaning land of the MR or pyramids. This word is directly connected to Mount Meru, also serving the same role as the Tree of Life. MR is different from the term Meri (Mry) used as an epithet meaning ‘beloved’ commonly used in the Middle Kingdom era (Murdock, 2009). One wonders about the relationship between Mr and Mry. Nevertheless, the Great Pyramid was also Mount Meru. The symbolism tells us that the Great Pyramid is the Axis Mundi and Tree of Life growing out of the sacred mound on omphalos land. The same theme is again duplicated in the Temple of Jerusalem (Templum Hieroslymoe) symbolism used by the Royal Arch Masonry showing a Triple TAU or letter T over letter H letter inside a pyramid (RAM, 2009). 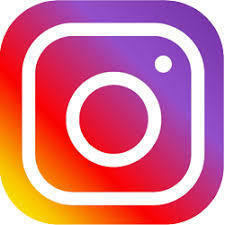 The picture that emerges with this symbol is of a T shaped object called the Tau that was kept inside the Pyramid as also suggested by Chinese usage of ta for pyramid. The Sanskrit usage of ta in the word tap for heat and shine as well as the Greek usage of the word pyramid meaning ‘fire in the middle’ suggest that the T tau object in the pyramid was capable of producing fire, heat or light. This clearly suggests the workings of some kind of technology with the Great Pyramid. If we say that the Great Pyramid is the Tree of Life are we saying it is the same Tree of Life recorded in world mythologies in association with human origins as in the biblical narrative of Adam and Eve? This implies that the Great Pyramid is not a product of the timelines of Dynastic Egyptian civilization as we know it but a legacy of an older civilization like Atlantis or possibly from an era the Egyptian called Zep Tepi. In ancient Egypt, the idea of survivors of an older advanced civilization is supported by text found in the Temple of Edfu in Upper Egypt. The Temple of Edfu in located on the west bank of the Nile River and goes back to the Ptolemaic period around 300 BC. The Edfu text talks of old times called Tep Zepi (Zep Tepi), or First Time, and the primordial mound, homeland of the Primeval Ones. This homeland island is submerged by some great flood represented by a great serpent or a wave. After this flood, the survivors meet at the field of reeds to plan the next move to re-erect a reed pillar as the foundation of a new civilization (Kurt, 2015). My guess is that this pillar is probably the Great Pyramid in Egypt. However, it is important to note that this event could have been a localized event in the region of Egypt during a very ancient age when they had lakes, many rivers, and other bodies of water capable of supporting a large island nation (Manetho, 1964, p.7). According to the Egyptian papyrus of Turin king list, Egyptian history is divided into three phases. The first phase was the era when primordial gods ruled Egypt, followed by the rule of demigods, and finally by the mortal humans. In total the three periods are estimated to date the beginning of Egypt to about 24 000 BCE or earlier. This implies that Egypt was part of, a contemporary of or a legacy of Atlantis. The word Atlantis should not be just confined to some mythical island in the Atlantic Ocean but any pre-flood, ancient advanced civilization including ancient Egypt itself. 20th Century American psychic Edgar Cayce also called the ‘Sleeping Prophet’ talked about the use of crystal energy in ancient Atlantis. One example of this was the use of a ‘Fire Stone’ called the Tuaoi. The Tuaoi not only provided energy for the civilization but was also used to communicate with other worlds. It had the capacity to capture solar energy, amplify it and distribute the energy in usable form. Before tossing Cayce’s information as mere new age rumblings, let take a moment to see if any serious scientist has had anything to say about the use of the Great Pyramid as a piece of technology and possibilities of generating energy from some stone or crystal. Physicist Joseph Farrell calls the Great Pyramid a weapon of mass destruction. He states, "The Great Pyramid was a phase conjugate mirror (magic mirror of legends), and howitzer, utilizing Bohm's 'pilot wave' as a carrier to accelerate electromagnetic and acoustic waves to a target via harmonic interfermetry" (Farrell, 2015). Engineer Christopher Dunn in his book The Giza Power Plant: Technologies of Ancient Egypt, says that the “Great Pyramid was a large acoustical device that created harmonic resonance with earth and converted Earth’s vibrational energies to microwave radiation” (Dunn, 1998). His journey began when he realized that the interior of the Great Pyramid looked more like a machine than a regular architectural structure or a tomb. This prompted him to investigate its possible design function as a machine. Dunn considers the Queen Chamber to be a Hydrogen Reactor where hydrated zinc chloride from the northern shaft and hydrochloric acid from the southern shaft produced hydrogen. The Grand Gallery on the other hand served as a sound generator equipped with Helmholtz resonators that emitted sound directed to the King’s Chamber. The understanding is that the King’s Chamber’s granite walls contain about 55% of quartz crystal with the capacity of producing piezoelectricity. The complex process resulted in the conversion of vibration into electricity. The biblical story of Moses is connected to the mystery of the Great Pyramid and the Tree of Life technology. In the Islamic tradition, the Mountain of Sinai where Moses received the Ten Commandments is called Tur-u-Sinin (Gallin, 2010). They also simply call it Mount Tur and its valley area is called Tuwa. The names of the Sinai area seem to all be linked to the words Tao and Tua. The Islamic tradition describes Moses as having seen fire in the direction of Tur and in the Christian bible Moses sees a burning bush. This seemingly unimportant variation is what actually brings together the Mountain/Pyramid (Tur), the Fire Stone (Tuaoi) and the Tree of Life (Tau). As the story continues we are told God’s voice came from the midst of the bush and said to Moses, “Do not come near here; remove your sandals from your feet, for the place on which you are standing is holy ground," (Exodus 3:4, NASB, 1995). This seems to imply that the area was charged with some kind of energy and Moses had to take off shoes to feel the charge but keep a distance for his own safety. The burning bush is described as burning without being consumed, leading us to believe that it was a piece of technology not on fire but radiating light. The question we are left with is whether this radiant bush device was at the mountain or inside the mountain. Mount Sinai is also referred to as Horeb and the mountain of God or Elohim. Horeb is said to mean "glowing/heat" (Jewish Encyclopedia, 2011) and it connects back to the meaning of the word pyramid. They called it the Mount of God as if God lived there, or possibly manifested or communicated there. Some versions of the bible do not say that Moses just climbed up the mountain but state, “So Moses set out with his assistant Joshua, and Moses went up into the mountain of God” (Exodus 24:13, NRSV, 1995). To show that this is not an isolated error the same concept of going into the mountain is repeated in Exodus 19:12 warning people not to touch or go into the mountain. Apparently, touching that mountain was a serious crime punishable by death. As the plot thickens, a cloud appears covering the top of the mountain and there is lighting, thunder and shaking as God descends onto the mountain. The description sounds as if God was landing his spaceship on the mountain top. Moses eventually goes up or into the mountain to see God, described as standing on a pavement of sapphire (Exodus 24:15-18, NIV, 1978). The idea of God standing on a sapphire crystal leaves us wondering if there was a crystal device in the Great Pyramid with the ability to project holographic images for communication or opening portals into other dimensions. Not forgetting that the Sinai Peninsula is in Egypt, when we examine the story of Moses, the Ark and the Stone tablets, a different picture emerges. We are dealing with drama occurring in Egypt rather than somewhere else. Simply put the mountain Moses climbs up to get the tablets is a Pyramid and two tablets of stones were most likely crystals from the Great Pyramid. When the crystal stone tablets were incased in the golden box the artifact was called the Ark and it gave off energy and could also be used for interdimensional communication. This matches the Tuaoi stone crystals housed in the Great Pyramid and also linked by others to Atlantis or Atlantian technology. In every Buddhist Stupa, there is a Tree of Life in the center considered very important and represented by wooden pole covered with gems and mantras. The Stupa being a structure symbolizing Mount Meru and the Pyramid, it would make sense to have that wooden pole with gems representing the Tao crystal. What then is the connection between the Tree of Life technology and the myth of the lost civilization of Atlantis? Since the Tree of Life myth or story is also about the beginning of human civilization, prehistoric civilizations with claims to the role of being the cradles of the human race have to be examined. Besides Plato, Edgar Cayce is also known to have spoken about the demise of Atlantis. In mainstream archaeology and history studies, the mention of Atlantis is unwelcome and associated with New Age quackery. Nevertheless, any serious study of very ancient history will find it difficult to avoid considering Atlantis or its equivalence when faced with evidence of the use of high technology in the ancient past. A comparative analysis of Plato and Cayce’s accounts in relationship to ancient Hindu text gives us a more solid picture of not only the possible fate of Atlantis but also its technology. Greek philosopher Plato’s account of Atlantis says the demise of Atlantis started when it invaded Athens in 10,000 B.C. Since Athens does not date back that far, we can just assume that Plato is talking about a civilization located in the area of Athens at that time or ancient ancestors of the Athenian people. According to Plato, the story of Atlantis came from Kritias’ ancestor called Solon who got the story from an Egyptian priest. The description puts its location west of the Strait of Gibraltar in the Atlantic Ocean. Established by Poseidon, Atlantis was technologically advanced and possessed high knowledge of engineering and architecture. In Cayce’s account, the fall of Atlantis is connected to the misuse of a special crystal energy used by the Atlantians as a source of energy. Towards its end, Atlantis had become divided into two groups, one interested in spirituality and another called the 'Sons of Belial' was interested in military power and conquest. This Belial faction is said to have done genetic engineering of man-animal hybrids for slave labor amongst other things. As the story goes, war started when the Atlantian Belial group invaded some Mediterranean states. The war culminated with weapons of mass destruction like crystal beam energy being used against areas of modern day Greece and Turkey. The misuse of that technology in prolonged war and possibly deep ground drilling projects backfired, resulting in explosions and earthquakes on Atlantis and culminating in the landmass collapsing into the sea as well as huge tsunamis flooding several continents. This event coincides with the end of the Younger Dryas phase of the Pleistocene Ice Age period about 11,500 years ago. Flood myths can be found all around the planet, with one the most common stories involving the biblical Noah as the flood hero. The name Noah or Nua is interestingly connected to some words used for water in different languages. In Egyptian myths, the primordial waters are represented by the god Nu (Nun). We find a similar character called Nu’u in Hawaiian flood mythology and Nuwa in Chinese flood mythology. In Hindu myths Manu is the equivalence of Noah. The “Ma” prefix in Ma-Nu represents water and is associated with the sea in some languages including Spanish and French. Manu is also connected to the English word Man. This link between Noah, Manu and Man is also seen in several African languages were the words for man include Muntu and Munhu, and words for people include Bantu, Antu and Vanu. The use of Ma for water is connected to the Egyptian word MW representing water. In Swahili and some Southern African languages like Shona the word MWA (MW, MUA) and NWA (NW, NUA) means drink, with the letters MW representing the water wave shape as shown in Egyptian water hieroglyphs and the NW being connected to the name Noah (Nuwa, Nua). The M and N combined also becomes Man and Manu. The destruction of Atlantis could have occurred in another scenario different from the one described above. In Hindu records, some ancient battles are described to have involved the use of weapons of mass destruction. Some of the events possibly happened during the time of Atlantis. One such deadly weapon recorded in the Mahabharata ancient Sanskrit writings was the Brahmastra. The Brahmastra “changed with all the power of the universe” was a weapon of last resort, of complete annihilation to both human targets and the environment. It was activated by specific key words or phrases, probably serving as passwords. In the Ramayana text, the Brahmastra weapon was used by a character called Rama in a battle against the Asura emperor Ravana, mighty ruler on the island of Lanka. One account in the Hindu text describes a similar weapon being used to part waters to reach the Island of Lanka. This type of technology seems related to the biblical Ark and Staff technology used by Moses to part the Red Sea and in battle. We usually imagine Moses’ staff as a wooden walking stick but it was actually something else called “the staff of God” (Exodus 4:20 NIV). It reminds us of the incident when Moses had a competition with an Egyptian magician. In the story, Moses and Aaron throw their staff down and it turns into a serpent, the Egyptian magicians do the same but Aaron’s staff swallows up their staffs. Rather than this being a strange incident of black magic this was actually a battle between the Moses and the Egyptian priests using technologically advanced weapons akin to laser swords from Star Wars movies. The coiling serpent from the staff is not a snake but some kind of energy resembling plasma in appearance. The same serpent energy form depicted as serpents on the walls of Dendera in Egypt is discussed further in paragraphs below. Since the Rama Empire existed during the time of Atlantis, it is plausible that Lanka was in fact Atlantis or an Atlantian state whose destruction came after their attempts to subjugate the Rama Empire. If we think the idea of weapons of mass destruction having been used around 9,600 B.C. by ancient civilizations like Atlantis and the Rama Empire is absurd, we should check what the father of the modern atomic bomb had to say on the matter. Dr. Robert Oppenheimer, physicist and director of the Manhattan Project is known to have quoted Bhagavad Gita after witnessing the nuclear test of 1945 when he said, “Now I am become Death, the destroyer of worlds” (AJ, 2015). On another occasion when Dr. Oppenheimer was giving a lecture at Rochester University, a student asked if the bomb they had exploded at Alamogordo was the first to be detonated. His reply was, “Well – yes. In modern times, of course” (Berlitz, 1981, p.129). One has to wonder what else this reply could have meant besides an admission that atomic bombs had been used in more ancient times. Apart from the written record, some researchers say that when the ancient Indus Civilizations of Mohenjo-daro and Harappa were excavated they yielded radioactive skeletons and vitrified walls possibly from an atomic blast. However, other researchers dismiss these findings as simplyy unconnected pieces not resulting from any major past blast. Even though this story sounds like fiction, an interesting clue on this ancient energy emerges from later periods of Egypt. The Dendera temple of Hathor contains every intriguing reliefs generally understood to show a New Year Celebration. Alternative researchers and fringe authors consider some of the depictions to be evidence of electrical lighting in ancient Egypt. This is because there are objects in the images resembling a light bulb in a socket connected through a cable to a power source. Egyptologists dismiss this theory and explain the images in Egyptian mythological terms. Even though Egyptologists can explain all the symbols and relate them to the associated text, it is also very likely that Egyptian priests deliberately encoded deeper meanings and hidden sciences in the basic images and the related text. In the image above we also see the Djed with arms holding or supporting the bulb. There are also two kneeling figures facing each other below the bulb probably representing polarity. This could be the same concept we see in the Smai Tawi image with two opposed figures on each side. The hn or transparent container in which we find the serpent called Hor-sema-tawy or Harsomtus may symbolize the cosmos or the sky. Harsomtus or Ihy is Hathor's son and is often depicted holding a sistrum and sometimes emerging from a Lotus. Author Normandi Ellis states, “Horus, the child, may appear under one of three names: Harsomtus, Hareseis, or Harpocrates. The child of Hathor and Horus is Ihy” (Ellis, p.91, 1999). In other words, Horus or Harsomptus is shown as a serpent, a falcon or as young Ihy. According to one researcher, “Har-Sema-Tawy depicted as a Hawk represents the sun, and Har-Sema-Tawy depicted as a Snake emerging from the Lotus flower represents something primordial which existed before the sun” (Oboadee, 2016). What he is saying is that the serpent in the image is not the sun energy but another form like atomic energy preceding solar energy. We could be talking some exotic energy we do not even know today or something as familiar as atomic energy from fission, opposed to the fusion process powering the sun. As we did in the previous chapter, it makes sense to associate the lotus and the serpent with not only energy but also portals as this is a cross-cultural theme found in Egyptian, Hindu and Mesoamerican symbolism. Nevertheless, as stated earlier, the Sun is a portal or doorway for travel from one part of the galaxy to another, therefore ancient technology connected to the Great Pyramid could have involved the use of the sun as a travel hub. Another significant figure in the image is the animal-headed creature standing on two legs and holding two knives. This creature is Upu, the frog-headed baboon and is considered a protective genie. According to author Stephen Mehler the creature is a companion of Thoth and the related text is about advanced energy and wisdom that can be abused. This takes us directly back to the Atlantis myth and its abuse of energy. The image above shows Ihy on the T shaped Smai Tawi equipment. This connects the Dendera temple image scenes to the T tau tree machinery. Ihy on the T tree and the primodial serpent emerging from the lotus suggest the generation of some kind of atomic energy beyond simply lighting bulbs. Could this be the same energy responsible for the destruction of Atlantis or other places like Mohenjo-daro or Sodom and Gomorrah? Let us keep in mind that the serpent or uraeus is sometimes depicted emerging from the Eye of Ra representing a portal. 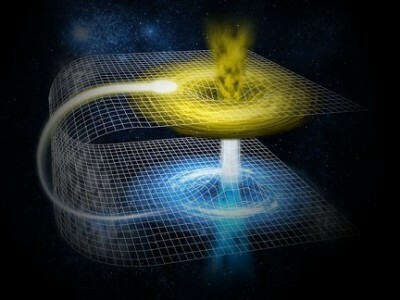 The energy source may also be connected to interdimensional portals or blackholes represented by the eye. The opening or wormhole at the top of the pyramid not only appears in modern symbolism as the eye on the pyramid but is also shown in less direct ways like the Chi Rho symbol. The Chi Rho (XP) symbol for Christ is often shown with the Greek letters Alpha and Omega on each side similar to the two-polarity positions with the axis mundi or Mount Meru in the middle. What appears to be a simple flat image of an X and P, when transformed into a three-dimensional view becomes a portal opening on a pyramid top. It is possible that the Smai Tawi device was part of the Tree of Life machinery inside the Great Pyramid. In simple terms, its components would have included amongst other things, omphalos crystals stones and a T-shaped Djed pillar resembling a Tesla coil assembled on a specific omphalos location with natural portals. The rotational churning process and toroidal energy flow would visually create the geometry of an inverted plasma pyramid or cone above the Great Pyramid resembling the Kerr Black Hole diagram. The Eye or open portal at the pyramid top serving as a doorway to other dimensions might have also worked as the entry point for exotic energy sipping from other worlds. Such a super machine served as a communication device, interdimensional travel gateway and an energy source. The graphic symbolism in the Egyptian Smai Tawi image and the Churning of the Milky Ocean in the Hindu Samudra manthan story can be compared to coils, the hurricane eye and CERN logo. The Great Pyramid of Giza and CERN’s Large Hadron Collider seem to be similar in that they probably both have the capacity to alter time-space fabric as well as impact human consciousness. If the Tree of Life device inside the Great Pyramid functioned with the special crystals as central components, it is possible that this was the same crystal technology used in the Atlantian myths. Cayce called the Atlantian crystal stones, Tuaoi Stones or Firestones. This same crystal material could be connected to the emerald stones brought by Thoth to Egypt after a deluge, as well as the benben stone and the Ark of the Covenant. Remember we mentioned that the word pyramid means “fire in the middle,” this name could have been in reference to the pyramid housing some Tuaoi stones or Firestones. The omphalos stones used throughout history were mostly likely rooted in the original crystal omphalos stone in the Great Pyramid. Some coins from Syria dating back to about 246 BC show god Apollo sitting on an omphalos (Firstlegend, 2016). Another kind of omphalos called Baetyl or Baetylus, rooted in the Semitic word Bet el meaning house of god, was curiously depicted as a tall pyramid on old Roman coins. The connections between the omphalos stone and the Tree of Life manifests also in the symbol of the pine cone. The pine cone is sometimes said to symbolize the pineal gland but also symbolize the fruit of the Tree of Life. The pine cone shaped object repeatedly shown being held by Sumerian or Assyrian characters towards the Tree of Life was probably a component that worked with the whole Tree of Life technology. The Omphalos crystal stones seem to also be linked to the Stone of Destiny fought over by some ancient Sumerian characters. In modern myths, the Stone of Destiny has in turn been identified with the Irish Lia Fail stone of Tara and well as the coronation chair stone of Westminster Abbey amongst others around the world. Between 1899 and 1902 a group called British-Israelites dug up the Hill of Tara in Ireland looking for the Ark of the Covenant. Apparently, Tara Hill associations with ancient relics not only include the Ark of the Covenant but also the stone pillow of Jacob from Bethel. There is a possibility that the Omphalos stones or remains of the Benben stone were taken from Egypt to Greece, Persia, Rome and Syria, then ended up in England or Ireland. Nailing down the location of the story of the Garden of Eden and the Tree of Life to one specific location is not an easy task if we take into consideration several relevant myths from around the globe. Those who follow Judeo-Christian myths place the garden and the Tree of Life in the region of ancient Mesopotamia and Turkey, and believers in the Atlantian myths places them in the Atlantic Ocean on the sunken Island of Atlantis. Others in the Far East place the location in the Indian and Pacific Oceans connected to the myths of Mu, Lemuria and Kumari Kandam. In reality all these locations could be true but in different ages of history, eventually synthesized into a single story over time. For example, it is possible that the Tree of Life was not located on a paradise garden but elsewhere at a different period in time but the two stories became one over time. Curry, Andrew. "Gobekli Tepe: The World's First Temple?" Smithsonian.com. November 01, 2008. Accessed August 02, 2017. http://www.smithsonianmag.com/history/gobekli-tepe-the-worlds-first-temple-83613665/. Choi, Soonwon, Joonhee Choi, Renate Landig, Georg Kucsko, Hengyun Zhou, Junichi Isoya, Fedor Jelezko, Shinobu Onoda, Hitoshi Sumiya, Vedika Khemani, Curt Von Keyserlingk, Norman Y. Yao, Eugene Demler, and Mikhail D. Lukin. "Observation of discrete time-crystalline order in a disordered dipolar many-body system." Nature543, no. 7644 (2017): 221-25. doi:10.1038/nature21426. Motesharrei, Safa, Jorge Rivas, and Eugenia Kalnay. "Human and nature dynamics (HANDY): Modeling inequality and use of resources in the collapse or sustainability of societies." Ecological Economics 101 (2014): 90-102. doi:10.1016/j.ecolecon.2014.02.014. Lovett, Richard A. "“Time crystals” latest quantum weirdness." Cosmos Magazine. March 10, 2017. Accessed August 02, 2017. https://cosmosmagazine.com/physics/time-crystals-latest-quantum-weirdness. 'Time crystals' built in the lab." Physicsworld.com homepage. Accessed August 02, 2017. http://physicsworld.com/cws/article/news/2017/mar/09/time-crystals-built-in-the-lab. "Big Bang gravitational effect observed in lab crystal." Nature News. Accessed August 02, 2017. http://www.nature.com/news/big-bang-gravitational-effect-observed-in-lab-crystal-1.22338. Kachisi, Adin. Deep Down The Rabbit Hole: The World Is Not What You Think. S.L. : Booklocker Com, 2017.